Although access to the friendly skies has greatly improved over the past 25 years, it still has a way to go. Take the lowly aisle chair, for example. Some travelers call it a torture device, while others describe the on board transfer process as “beyond humiliating”. Either way, the whole system could use a facelift. And that’s just what Paul Priestman, founding director of Priestmangoode intends to do. 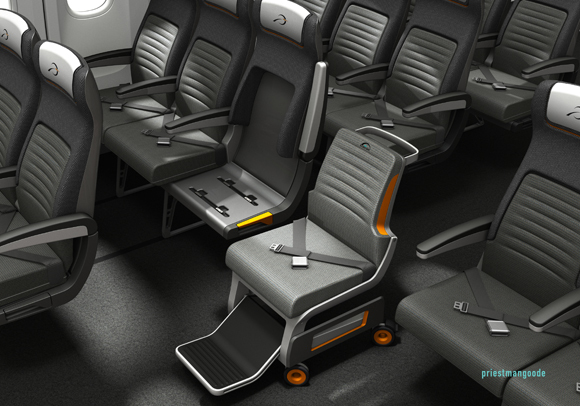 An expert at designing luxurious aircraft interiors, Priestman recently turned his attention to access, and came up with the Air Access concept. This combination boarding and seating system is comprised of a detachable aisle chair for boarding and deplaning, and a fixed seating frame that the aisle chair can be attached to, to create a regular airline seat. Basically this means that you’ll only have to transfer once — to the aisle chair. After that, ground personnel just wheel you aboard and attach the aisle chair to the seat frame. On arrival, the aisle chair is again detached and you are wheeled off the airplane. The chair also has a removable seat pad, so you can comfortably use your own cushion for the duration of the flight. As an added bonus, the Air Access seating system also doubles as an on-board wheelchair, should you need to use the facilities during the flight. And when the seat isn’t being used by a passenger with a disability, it can be used by an able bodied passenger. Simply put, the Air Access system is universal design at its best. Unfortunately now it’s only a concept as no airline has actually ordered it yet. But we can always hope things will change in the future. At least we finally have a great design, and that’s half the battle. American Airlines — Right or Wrong? This entry was posted in Air Travel and tagged accessible travel, air travel, aisle chair, boarding, disabled travel, travel, universal design, wheelchair by Candy B. Harrington. Bookmark the permalink.